A few months ago Slitherine was contacted by a computer engineer from Turkey (birthplace of the Emperor, beloved by all) called Gunes Kuday. He is a fan of Warhammer 40,000: Armageddon and he proposed to work on a free update for it. There were some aspects of the game he wanted to improve, so we gave him the source code and he has worked since then to expand the game. We are happy to announce that the first community update for Warhammer 40,000: Armageddon is now ready! It is a completely free and optional update, one that you can now download easily from this link or this one. It is stand-alone, you just need to have the base version of Armageddon installed on your computer (either the Slitherine or Steam version). To play it, after downloading, unzip the files and put them in a new folder on your hard drive, not in your game files folder, and run ArmageddonGame.exe. It is a stand-alone: you can just download, place the files in a new folder, and play, without needing to install anything! You only need the base game installed on a different folder on your computer. Thank you so much Gunes for your hard work! For this occasion, we are also putting Armageddon and all its DLCs on sale for one week! Don’t miss it! It is now possible to mod the game and add a fourth weapon to any unit, and it will be shown in every screen in the game! Furthermore, Baneblades were given extra weapons to fill the 4th slot, and they are now more powerful than before. Now the “siege” weapon trait makes it ignore half of the target’s cover bonus, making all siege weapons really good at hitting units in cover. Now weapons with the Terror trait will cause 10 points of extra morale damage, making them extremely effective at destroying the enemy morale. AA Weapons will now have 100% accuracy against Flying units. Did you ever find that those deffkoptas were a thorn in your side? Fear no more and use those AA guns! - Now, you can add 4 weapon to any unit in the game. To Orks, Steel Legion and all Space Marines. - AA weapons affect related units much more. For example you can see flyer units can't evade AA weapons anymore. - Terror weapons really destroys unit morale now. - Siege weapons do significant damage to any unit in cover. They are "real siege weapons" now. And also you can see Siege trait icon in unit details GUI which wasn't exist before. All changes are also dlc compatible. You can use them in your dlcs too. I hope you will enjoy new features! A very quick mention: First screenshot is just for demonstration to 4th weapon. Macharius Vanquisher doesn't have 2 Stormshard Mortars actually =) But it's a demonstration that you can add any weapon to any unit and it will have proper GUI view, animation and sound effects! The link isn't working at the moment, but look forward to trying it out once it is. Sorry for the Dropbox link which stopped working guys, we're re-uploading the update on an FTP server. We'll post a functioning link soon (as well as edit the first post). Can't download it yet: "This link is temporarily disabled. The person who shared it hit their daily limit of traffic or downloads." Both should appear in one box, now they appear in two boxes, which pop up one after the other. You can´t choose the first variant. You can also download the files from this alternate link. i confirm the error with the choice in briefings. I KNOW this is free, so feel free to disregard my suggestion. i think that certain weapons should have a flat bonus to accuracy against tanks and titans. like lascannons, or vanquisher cannon. it's a good way to balance anti-tank weapons without making them overpowered against infantry. this could be done with a pair of traits like "Flyer" and "AA". "Tank" and "Anti-Tank". 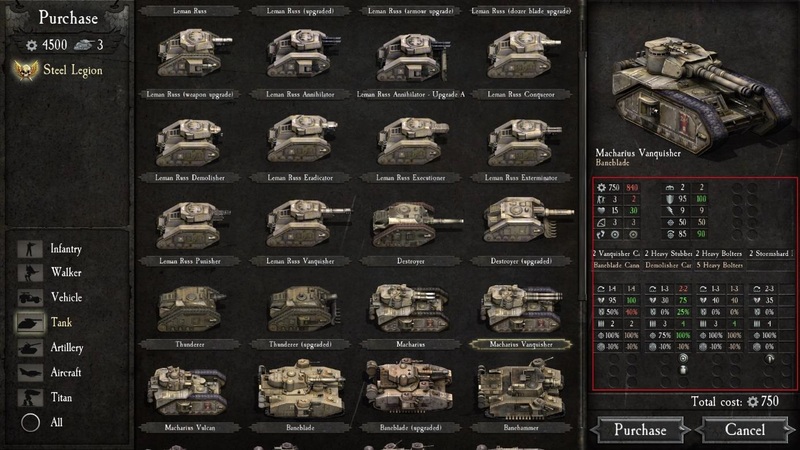 the "Tank" trait is just a marker for units and don't have any effect. 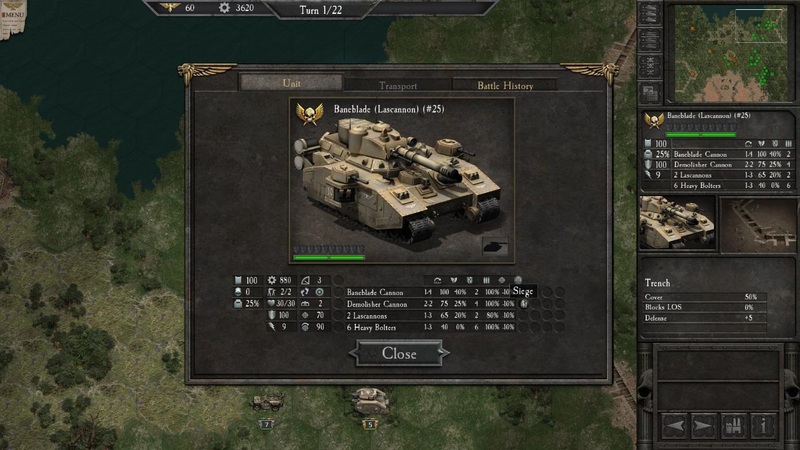 the "Anti-Tank" trait is for weapons and gives double accuracy against units with "Tank" trait. it's not complicated (at least for the players) and it's really useful for balancing purposes. but it's not in the base game so i don't know how much complex is the task to add it in the code. for example, a lascannon have double accuracy against a leman russ. but not against walkers like dreadnoughts or killa cans. Or any infantry. Briefing screen error will be fixed, sorry for that. Thanks for ideas! There are intentions to add new traits, weapons etc for the future. And it's not too complex to do in code. But I can't decide by myself and needs to be discussed. If it will be decided, then I can work on that as soon as possible. By the way, have you tried my mod in the mods section? It adds tens of new units with 4 weapon on most of units, new sound effects, new stats etc. toupou wrote: this could be done with a pair of traits like "Flyer" and "AA". "Tank" and "Anti-Tank". I never had the feeling that AT weapons were underpowered against tanks. Also, this would be very unintuitional. AT weapons are not known for better accuracy against tanks, but for better penetration (or penetrating at all). It would be weird for them to easily hit metal cans on the ground, but not those slightly above the ground, like Titans. Sure, reality isn´t the gold standard for WH40k. i've seen your mod and played a little, deranzo. i really like the artwork of the game, so i don't like much the photoshoped new images. i prefer rebalancing and small changes (like adding or removing sponsons) instead of totally new units. i play in normal too and balance the game for this difficulty. But i guess i can give it a go in hard. sn0wball. titans should have the "tank" trait. And metal cans shouldn't (as in heavy armored walkers). fast vehicles like tauros, bikes and warbuggies... that it's a good question. maybe they shouldn't. but big tanks? no matter the rules of the tabletop game, it makes sense that a big target it's easier to hit. tanks don't rely on accuracy ratios of the enemies, they rely on armor and being suported by other vehicles and infantry. so, a lascannon should have high accuracy (+80% in most situations) and ~100% with normal morale and clear terrain. example: lascannon: 100% -10% accuracy. shoots two hexes ahead, clear terrain no LoS obstruction, and normal morale we have 80% accuracy. it's a leman russ, and they have 60% accuracy, so the final accuracy is 48%. this is the number that is doubled. so, 48% accuracy against a ork boy AND a killa can or other walkers, but 96% accuracy against a grot tank. i know that it's even easier to hit a tank with a bolter, but a bolter would bounce off the tank. so the accuracy is fine as it is in the case of small arms and other heavy weapons like heavy bolters and autocannons. toupou wrote: i've seen your mod and played a little, deranzo. i really like the artwork of the game, so i don't like much the photoshoped new images. i prefer rebalancing and small changes (like adding or removing sponsons) instead of totally new units. i play in normal too and balance the game for this difficulty. But i guess i can give it a go in hard. Keep offering guys, I will add them together, decide and will update the game in the future (I can't say how soon for now) according to those. I have created a topic for suggestions and bug reports for new version. Please write in there from now on. I cannot see the new tanks. Only the old ones show up. Am I mising something?